With both the warmth of a traditional chair and the clean fluid lines reminiscent of a modern sculpture, the Tendy Pro Stack Chair is a seamless blend of styles and a perfect pairing of form and function. The Tendy features a slender and graceful chromed steel base, which adds durability, sophistication and shine. The chair�s seat and back are crafted from a wood shell, which features a walnut finish with visible wood grain for added warmth, depth and character. The seat curves artfully to add visual interest and comfort. Use the Tendy as a dining chair, or as a stylish occasional chair. It�s stackable, which makes it easy to stow away when not needed. The walnut finish on these chars is awesome. Look great around our Nelson swag leg table. Does this chair come in other colors (white)? Hi We are considering using this chair in a hotel meeting/dining room. Is this chair good for commercial use? 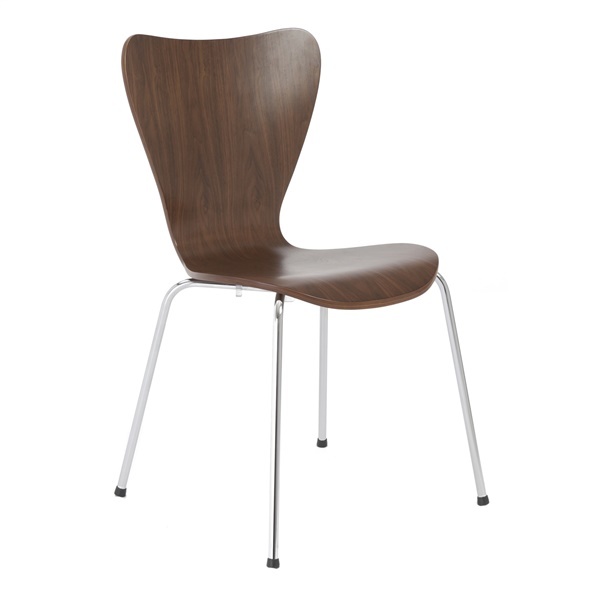 This chair is made to be used commercially and is a great choice for your hotel project.